Catania to see. Accommodation, history, cooking and traditions of Catania. Catania is a prime tourist destination. Bang in the middle of the Ionian coast, Catania is Sicily's second largest city and a point of arrival for most of the island's foreign visitors, who land at the airport just outside. Catania is one of the most intriguing of Sicily's cities, with a lot of history. Some of the island's first Greek colonists, probably Chalcidinians from Naxos, settled the site as early as 729 B.C., becoming so influential that their laws were eventually adopted by all the Ionian colonies of Magna Graecia. Later, the city was one of the first to fall to the Romans, under whom it prospered greatly. In the early Christian period Catania witnessed the martyrdom of Agatha, who, having rejected the improper advances of the praetor, Quintianus, was put to death in 252 A.C. She was later canonized (becoming the Patron Saint of Catania) and it was her miraculous intervention that reputedly saved the city from complete volcanic destruction in the 17th century. The city was completely devastated by the earthquake of 1693. This also marked the rebirth of a new city laid out according to a more modern urban plan with wide streets, piazzas and monuments. The main force behind the change was the architect Giovanni Vaccarini that, making full use of local building material (lava), gave the city a lofty, noble Baroque air. The colors of the city are predominantly black and white, and these are used in combination to maximum effect. Catania is a very good place for eating: fresh fish is a speciality, and there are many good restaurants about. Catania's student population ensures a fair choice of youthful bars and pubs, many with live music, which stay open late. In addition the City Hall operates Caffè Concerto periods during the summer, when the old town streets and squares between Piazza Università and Piazza Stesicoro are closed to traffic between 9 p.m. and 2 a.m. The bars here all spill tables out onto the squares and alleys, and live bands keep things swinging until the small hours. Acicastello for the 13th century castle that rises above the sea in splinters from a volcanic rock crag. Acitrezza for the gulf and the faraglioni (Rocks of the Cyclops). It is the city of the Malavoglia (Giovanni Verga). Acireale for the Baroque Palazzi. 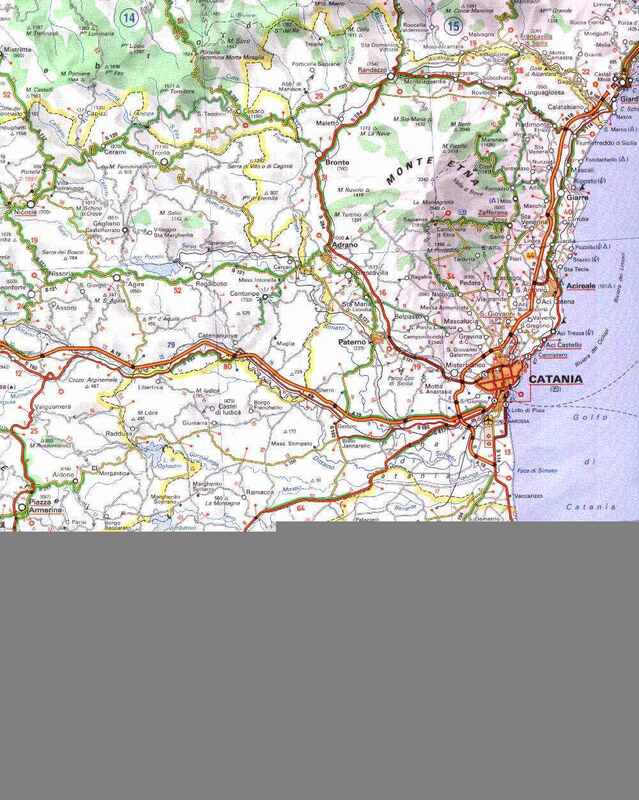 Map of the Catania province.